The following article is an attempt to gather together the available information on the British, commonwealth, and British supplied tank formations that served in Italy and 1944 and 1945. 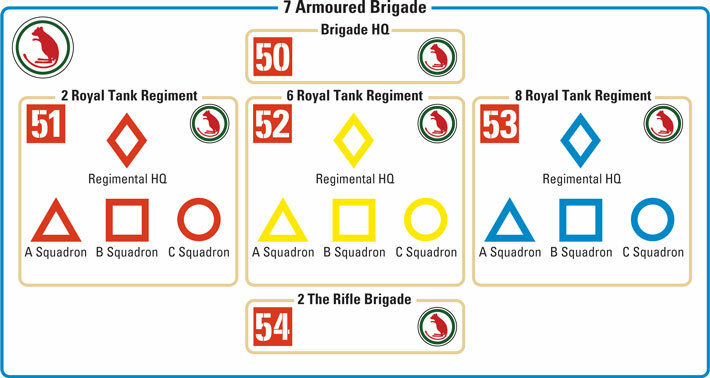 Included are the tactical marking, unit signs and arm of service flashes (the numbered coloured squares). 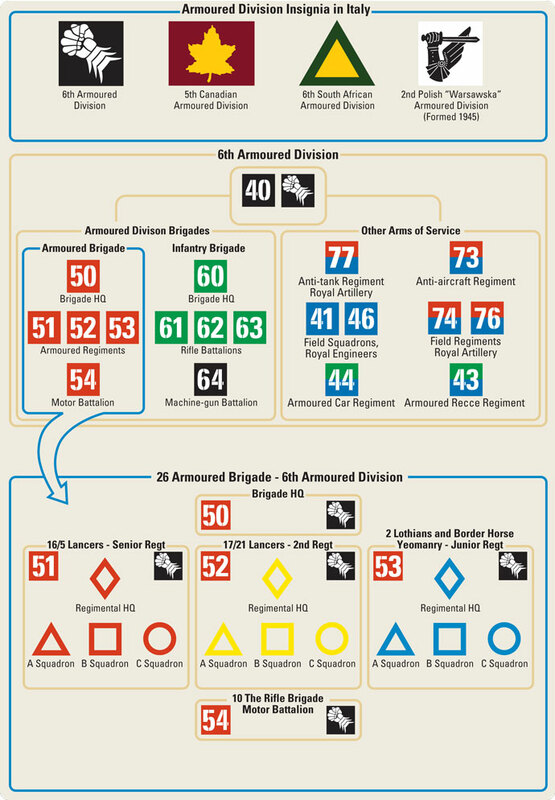 But first here is a breakdown of the Brigades and Divisions and which higher formations they served under. The armoured vehicles in Italy carried a number of markings including the usual geometric tactical symbols on the tank turret or hull side, a brigade or division unit sign and a arm of service flash. The following illustrations show the markings of the units in Italy with appropriate notes before each diagram. Three “British” Armoured Divisions served in Italy in 1944-45. The 7th Armoured Division did serve in early 1944 but was sent back to Britain to prepare for D-Day, leaving the 7th Armoured Brigade in Italy. 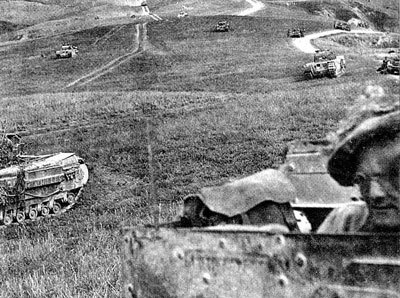 The 5th Canadian, 6th and 6th South African Armoured Divisions fought during most of the Italian Campaign. For a short period the 1st Armoured Division arrived from Southern Tunisa to join 5th Corps at the Gothic line, but owing to the fact that they had not been in battle since March 1943 they did not perform very well and were disbanded in late in 1944. Additionally the Poles formed an armoured division in early 1945 based around the 2nd Polish Armoured Brigade, but the war ended before it saw serious combat. The 7 Armoured Brigade had previously served with the 7th Armoured Division and retain a variation on the Desert Rat as their unit sign. 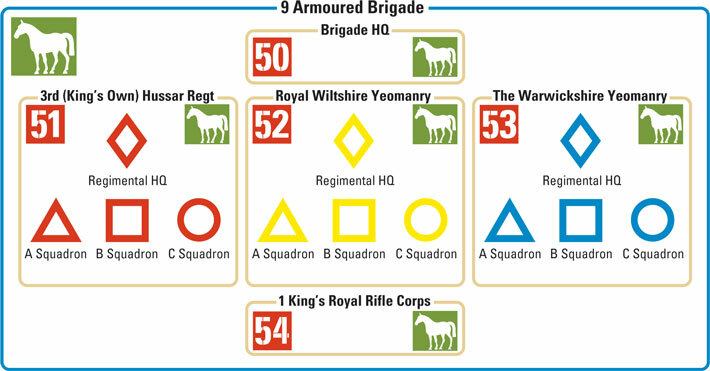 They also retained the armoured division 50-54 arm of service number series. They seemed to have retained their Motor Battalion as well. 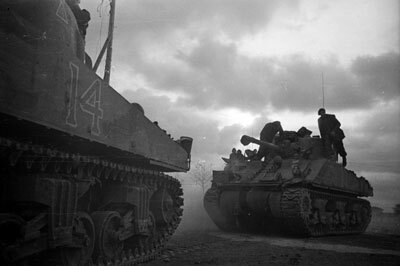 Left: 76mm Sherman II with the 7th Armoured Brigade in Italy in December 1944. The 9 Armoured Brigade arrived in Italy after refitting in Syria. While in Syria they retained the 71, 40, 86,67, 60 arm of service series on a brown box as used in the desert, but on arriving in Italy it is likely they moved to the 50-54 series on red like most independent armoured brigades and armoured divisions. Their unit sign is a horse on a green box. As a recognition of their work with the 2nd New Zealand Division in North Africa they could display a 6”/15cm white fern leaf on a black box above the tank names on the hull sides, but not all tanks did so. I could find little information or tank photographs of the 23 Armoured Brigade’s Shermans so I am only assuming they used the 50-54 series. Their symbol is the LiverBird, also a symbol of the City of Liverpool. Though this brigade was part of the 2nd New Zealand Division it was also often used to support other Allied units. The New Zealanders combined their arm of service symbol and the unit sign (the New Zealand silver fern). They used an arm of service series unique to them. The "odd" numbering was taken from the mid war shortlived British experimental composite infantry divisions with an integral armoured brigade - a sort of British Panzergrenadier division. 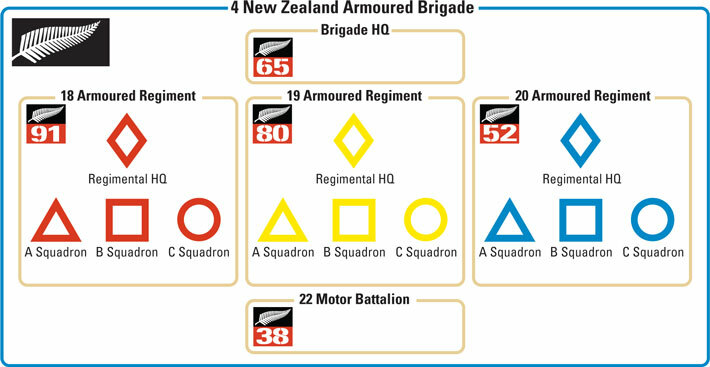 None of the British versions of this saw service outside of the UK, but the Kiwis adopted it when they added the armoured brigade. Right: New Zealand Shermans in November 1944. 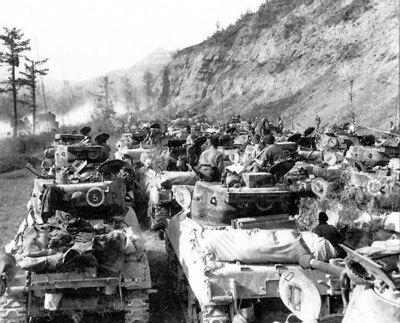 The Canadians’ had a large presence in the Italian theatre, and as well as the 2 and 5 Armoured Brigades in the 5th Canadian Armoured Division they had the 1 Armoured Brigade Serving independently supporting other Canadian divisions. They used the 172 to 175 arm of service series on a blue over brown box. Their unit sign was a black-red-black horizontally divided rectangle. A yellow maple left was laid over the design. This brigade had no Motor Battalion. 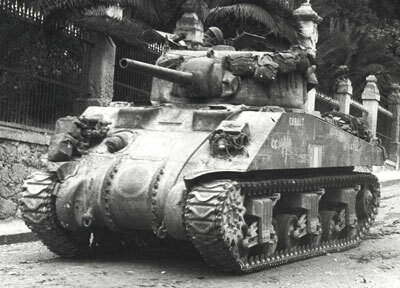 Left: A Canadian Sherman of the 12 Armoured (Three Rivers) Regiment. The Polish fielded an entire armoured division in Normandy and were building towards a second in Italy. The Poles used armoured winged sword bearing arm as their brigade and later division sign. They used the 50-53 arm of service series and did not field a Motor Battalion until the division was formed in 1945. Like all the tank brigades the diabolo played an important part in the unit sign. Initially this was just a simple blue diabolo, but by 1944 a yellow background circle with a red devil wrapped around the diabolo was added. They used the 172-175 arm of service series on a yellow over red box. The numbering system used for the 21st Tank Bragade was changed from that illustrated on 22 August 1944 when they were changed enroute to the Gothic Line battle to support 2nd brigade of the Canadian 1st Division. The colours of the Arm of Service numbers were changed to those of the 1st Canadian Armoured Bragade. 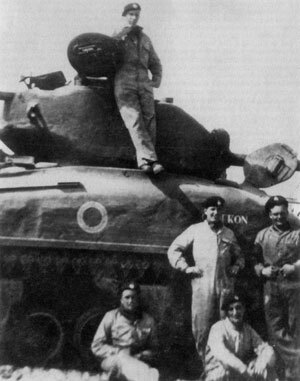 The 25 Tank Brigade used a diabolo (black) as their unit sign. By 1944 it was on a Red and yellow shield. They were awarded a Canadian maple leaf in 1944 for service with the Canadians during the breaking of the Hitler Line, which was placed in the top triangle of the diabolo. Their arm of service numbers ran from 160 to 163 and were on a black box. Any further information is welcome.